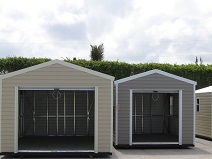 "A Place to stash your stuff"
All our Lark Sheds are DCA certified and meet Florida's 160 Mph wind code requirements. We specialize in providing the highest quality portable buildings and sheds to the treasure coast at affordable prices. Check out our large assortment of stock sheds or have one custom built to your own specifications. As an agent for Carolina Carports we help you design and order the carport that is right for you. Design your own from scratch. Carolina assembles on site the latest technologies in carport and steel building design. Since 1997, Lark Builders, Inc. has dedicated themselves to manufacturing the best portable building in the industry. Their attention to quality, durability, and product value is why Lark is:"The Standard in Portable Buildings." Carolina Carports, Inc. was founded in 1997. The company’s primary function is to manufacture metal products by using the newest technology as well as engineered expertise and up-scaled machinery. Carolina Carports, Inc. offers its quality products through a network of trained representatives across the United States. We also use the services of highly skilled contractors for the professional installation of each product. We at the Shed Shop have dedicated ourselves to bring you the highest quality and service possible in the portable building industry. Now servicing South florida through our offices in Port St. Lucie, Hobe Sound, and Lake Worth, Florida. We are an authorized dealer for Lark Builders, Inc.. Since 1967, Lark Builders, Inc, has dedicated themselves to manufacturing the best portable building in the industry. Their attention to quality, durability and product value is why Lark is "The Standard in Portable Buildings." Some manufacturers spend their money on marketing schemes and gimmicks. Lark invests their money in their products and you can see it in every portable building they build. Their innovative construction techniques and state of the art equipment insures that your Lark Building will be second to none. While others are playing catch up, Lark is out in front with cutting edge improvements. Lark doesn't take short cuts. Their approach has never been to just get by; They are committed to building the best.